AssetPro is a straight forward and easy to use Fixed Asset Accounting software solution. Designed for businesses with standard Fixed Asset Accounting requirements providing a comprehensive set of reports that include current, prior and future period reporting options. 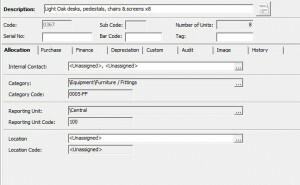 Simple, user friendly screens detailing all the asset information at the click of a button. User definable hierarchies to allow company structure to be fully represented and easily updated. Asset Import facility for the initial upload, daily and monthly additions ensuring the asset register is quick and easy to update and manage on a regular basis. Advanced reporting wizards that ensure quick and easy reporting for current, past and future transactions. Export and import of data to and from other systems including Microsoft Excel, PDF and HTML allowing integration to other systems or simple reporting to users preferred working documents. Customisable depreciation to allow for variances to the standard policies to be accounted for. User definable fields to incorporate additional company specific information not stored in the package as standard thus enabling a central data set for all your asset management needs. Asset Tracking information* quickly available within the central asset record showing when it was last audited and what the status of the asset during the audit was. AssetPro is supplied with a data setup facility; clearly defined period end routine, a variety of depreciation methods and a set of standard reports that are compliant with UK GAAP and IAS. If you are interested in further information on AssetPro please contact us to discuss your requirements in more detail and to arrange an online demonstration. Call +44(0)870 112 0700. If AssetPro does not meet your needs and you are looking for something more comprehensive and flexible, then try Assetware Manager. *Information available from Assetware Tracker.